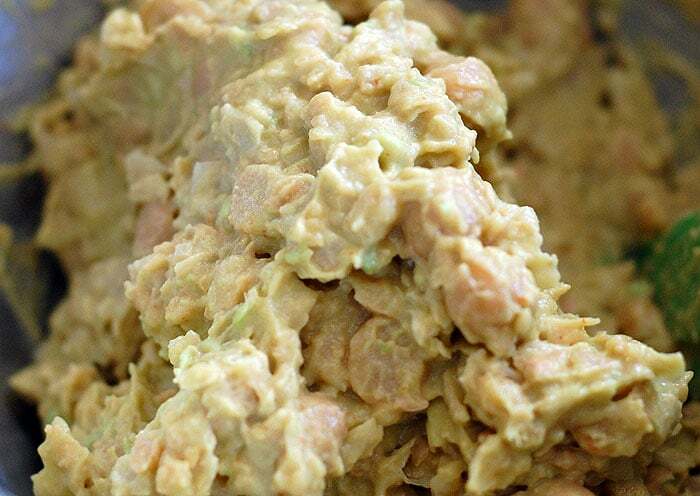 This Sriracha Avocado Chickpea Salad could not be easier or faster to make. It takes about 5 minutes to throw it all together and is my new go-to lunch. My problem is that when I’m working I don’t notice it’s time for lunch until I start to feel grumpy. ‘Hangry’ is really the perfect word for that angry feeling I get when I’ve waited too long to eat. My life works best if I have some chickpea salad made up and ready to eat in the fridge, it’s so quick to make I can make up a batch in the nick of time too. 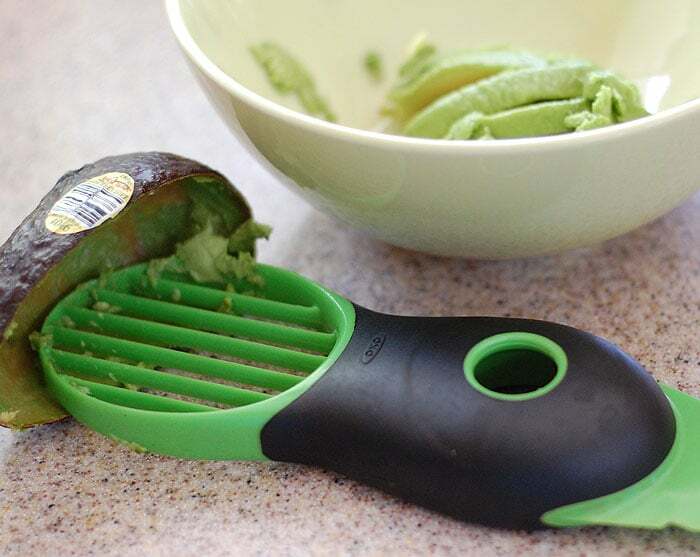 I use my OXO avocado tool to get as much as possible scraped out of my avocado. I like that you can cut, pit and scoop in one tool. You don’t have to have one, but be sure to use it if you do. 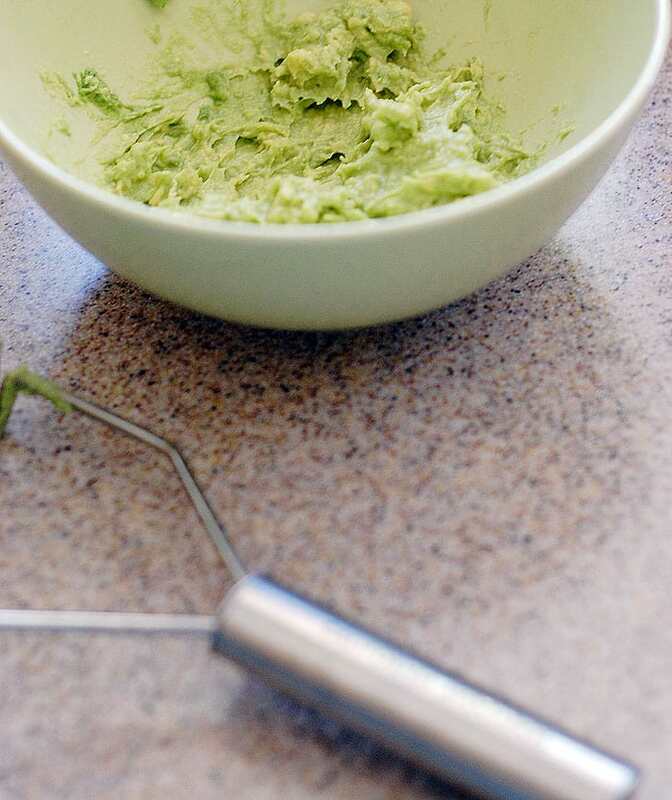 Then just mash the avocado, add the vegan mayo, and sriracha with the seasonings. I even put my bread in the toaster before I even begin because it comes together so fast. I use some liquid smoke in this, but if you’re not a fan just leave it out. I love smokey flavors and think it adds another layer of flavor that makes this spread seem more complicated than it is. Need something you can make in less than 5 minutes? This is the recipe for you! Mix all the dressing ingredients in a bowl. Add the chickpeas and mash, leaving them chunky. 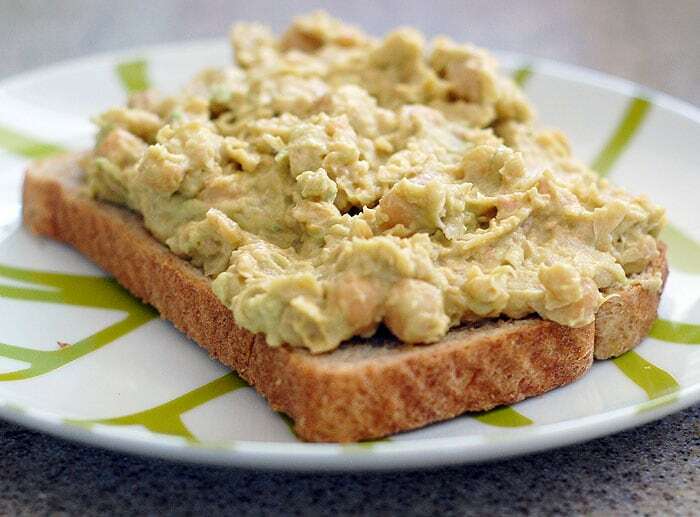 Spread on toast or crackers for the fastest meal ever! all I can say is yum! Thanks because chick peas and avocados have to be two of my favorite things and I would never have thought to combine them. not sure where you could buy it where you live. I swear by it. Sort of a CA hummus… in fact, I bet tahini would be great in there. Good idea, thanks! That would certainly be tasty too! Let’s rename this “Everything Good on Toast” !!! Sriracha? Chickpeas? Avocado? Yes, most definitely! What a fab sandwich this makes! Your blog and the picture made me so hungry, I had to make it right away and BOY AM I GLAD I DID! Since I had the time and needed to use up some of the stuff in my refrigerator, I added chopped celery (love crunch), sliced green onions (at the end), and some hearts of palm. Because of the extra ingredients, I increased the avocado mixture to keep it moist. Served it to my husband and he LOVED it! Thanks so much Kathy, you have wonderful & yummy ideas. Keep ’em comin’!!!!! This recipe was so yummy! 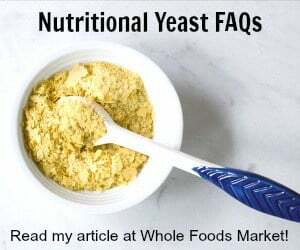 It has me rethinking the whole need for mayo at all… the avocado itself seemed to make a great mayo substitute, which I’d never considered before, so I think I’ll try it without next time. But I loved it… the liquid smoke and sriracha were so good with this! Thank you for posting! You could do it without mayo. I would add a touch more apple cider vinegar or lemon juice if you do leave it out. That will give it that extra twang that the mayo adds. I’m more than a little in love with Just Mayo too! By the way, I enjoyed your interview with Chef AJ… I didn’t realize you were from NC, too. I’m in Apex. Nice – I’m in Durham. We should meet for a coffee or tea sometime! I so need to try this! It looks perfect! Delicious. Was tempted to use horseradish and maybe will next time but so delicious! Thank you for sharing this recipe! I made it this afternoon for lunch, and it was very good. The only thing I changed, is I added jalapeño instead of green onions because I didn’t have any. I put it in a toasted whole wheat pita with butter lettuce. Really tasty. So glad you like it. I’ll have to try it with jalapeno next time! You mentioned this on my causa post and I had to check it out! Looks amazing! I can’t wait to try it out!